Prime Minister Sheikh Hasina is likely to induct three new faces in her cabinet and promote two junior ministers to the full rank today to bring dynamism in the function of the government. 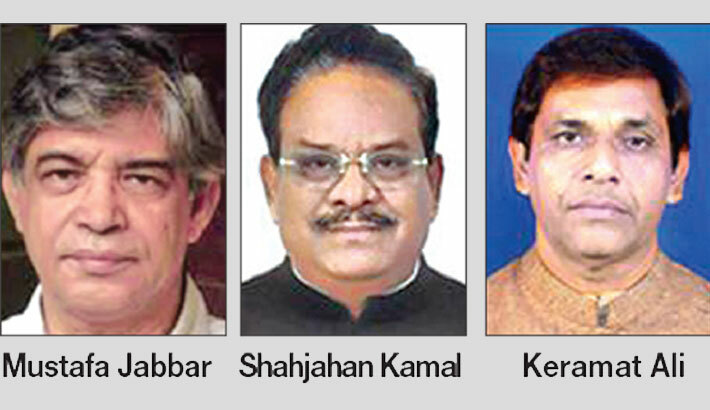 As part of the move, State Minister for Fisheries and Livestock Narayan Chandra Chanda, Luxmipur-3 lawmaker AKM Shahjahan Kamal and Razbari-1 lawmaker MP Kazi Keramat Ali have received calls from the cabinet division. IT entrepreneur Mustafa Jabbar is also being considered under the technocrat quota. The premier can make the reshuffle in the cabinet in exercise of the power bestowed upon her under the Rules of Business of 1996 with an immediate effect. Chanda told reporters that he received a phone call from the cabinet division in the afternoon. “The cabinet secretary made a phone call to me. I have been requested to be present at Bangabhaban on Tuesday evening,” he said. Kamal said he also received a cabinet division call and is going to Bangabhaban on Tuesday evening. Sources in the government said six faces may be inducted into the cabinet today. Two junior ministers may be made full-fledged minister while the new faces may be awarded important portfolios, including the home, information and ICT, sources said. President Abdul Hamid is scheduled to administer the oath of office to them at Bangabhaban Tuesday evening. Prime Minister Sheikh Hasina, her cabinet colleagues and other dignitaries are expected to be present at the swearing-in ceremony. The issue of reshuffle in the cabinet came to the fore after the death of Fisheries and Livestock Minister Sayedul Haque on December 16. Sources said the prime minister is thinking of inducting some more new faces in the cabinet to bring dynamism in the function of the government ahead of the upcoming parliamentary polls. They said some ministers of the cabinet have sparked serious controversy since Awami League President Sheikh Hasina took oath as the prime minister for the third time and formed the government comprising a 51-member cabinet. The premier may bring some inter-changes of portfolios as she has been unhappy on some ministers for their excessive talks and inefficiency, they said, adding that induction of some new clean-image faces might be a part of the reshuffle. Her council of ministers comprises 31 ministers, 17 state ministers and two deputy ministers. Of them, 44 are from Awami League, three from Jatiya Party (Ershad) and one each from Workers Party of Bangladesh, Jatiya Samajtantrik Dal and Jatiya Party (Manju). Abdul Latif Siddique was the first minister who was dropped from the cabinet of the incumbent government for his remarks against prophet (PBHH), Hajj, and Tablig Jamaat. Syed Abul Hossain was axed from Hasina’s previous cabinet amid a widespread criticism of the minister’s alleged involvement with corruption in Padma Multipurpose Bridge project. Though Suranjit Sengupta stepped down from the railway ministry on the face of a financial scam, he was kept in the cabinet without portfolio. The last reshuffle took place on July 14 in 2015, inducting three new faces in the cabinet and promoting two state ministers to the rank of full ministers. Nurul Islam has been given the portfolio of expatriate welfare ministry while Tarana Halim and Nurruzzaman Ahmed have been made junior ministers for the post and telecommunications and food ministry respectively. Nurul Islam, vice-president of the ruling party’s Chittagong metropolitan unit and managing director of Sanowara Group, had won the 2008 general elections from Chittagong as a rebel candidate. But he had to sacrifice the Chittagong-8 seat for Jatiya Party’s Ziauddin Ahmed Bablu in the last parliamentary elections for the sake of grand alliance politics. Reserved seat lawmaker Tarana Halim is a renowned actress and cultural activist. She was the women affairs secretary of the Juba League while studying at Dhaka University. She was selected an MP for the reserved seat twice. Nuruzzaman Ahmed has been elected as a member of parliament from the Lalmonirhat-2 constituency for the first time in the last polls.